At Latitude we've always had recycling initiatives for our left over granite slabs. Sink cutouts are no different, we've come up with some great ideas over the last year to make products that consumers want out of our left over granite. We've made granite cutting boards, granite lazy susans, and now we're making granite bbq shelves. 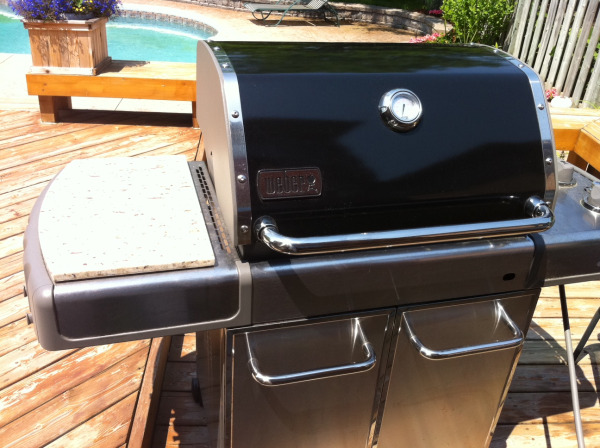 They are custom measured so they fit any side shelf and they add a look of elegance to any bbq. When we mentioned them to our friends at Barbecues Galore they loved the idea, and so far they are selling them as fast as we can make them. We've been making them in all colours but the black ones seem to be the biggest hit. For more information on how you can get your custom barbeque shelf please contact Latitude or Barbecues Galore.